Since it was founded in 1920, the Tavistock Clinic has developed a wide range of developmental approaches to mental health which have been strongly influenced by the ideas of psychoanalysis. It has also adopted systemic family therapy as a theoretical model and a clinical approach to family problems. The Clinic is now the largest training institution in Britain for mental health, providing postgraduate and qualifying courses in social work, psychology, psychiatry, and child, adolescent, and adult psychotherapy, as well as in nursing and primary care. It trains about 1,700 students each year in over 60 courses. 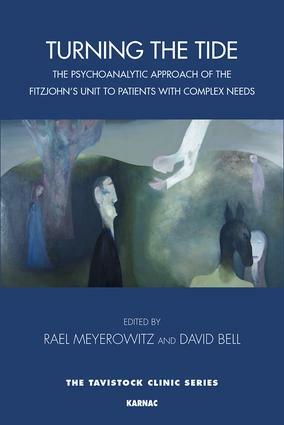 This important volume traces an impressive range of descriptions, all clinically based, of the work of the remarkable Fitzjohn's Unit, which has about 60 patients under its care at any one time. The book also evokes a clear sense of collective commitment, one that has lasted over seventeen years, since its beginnings as an experimental project that was set up by David Taylor in 2000. Rael Meyerowitz was born in South Africa. He is an adult psychotherapist and psychoanalyst (member of the British Psychoanalytical Society since 2004), having embarked on clinical training in mid-life, after an earlier career as an academic in a range of humanities disciplines and on several continents. In addition to working clinically at the Tavistock and in private practice, he teaches a variety of psychoanalytic subjects on the Tavistock's adult psychotherapy training, at University College London, the British Psychoanalytic Foundation, and elsewhere. David Bell is a Consultant Psychiatrist at the Tavistock Clinic in London, where he directs the Fitzjohn's Unit, a specialist service for serious/complex psychological disorders. He is visiting Professorial Fellow, Birkbeck College, London and past President of the British Psychoanalytical Society. Throughout his career he has been deeply involved in the relation between psychoanalysis and literature, philosophy and politics, and has made numerous contributions in these areas. He is one of the UKâ€™s leading psychiatric experts in asylum/human rights. He is contributing editor of Reason and Passion and Psychoanalysis and Culture: A Kleinian Perspective.